On Thursday, April 19, 2018, we had the opportunity at Oniris to receive welcome Néus Palau-Barreda, veterinarian and farrier, recently installed in Douvres-la Délivrande (14), as well as Fabrice Cavé, sales manager at Mustad Hoofcare, former farrier and teacher. They supervised a horse shoeing clinic divided into 3 parts for 20 students from different years. 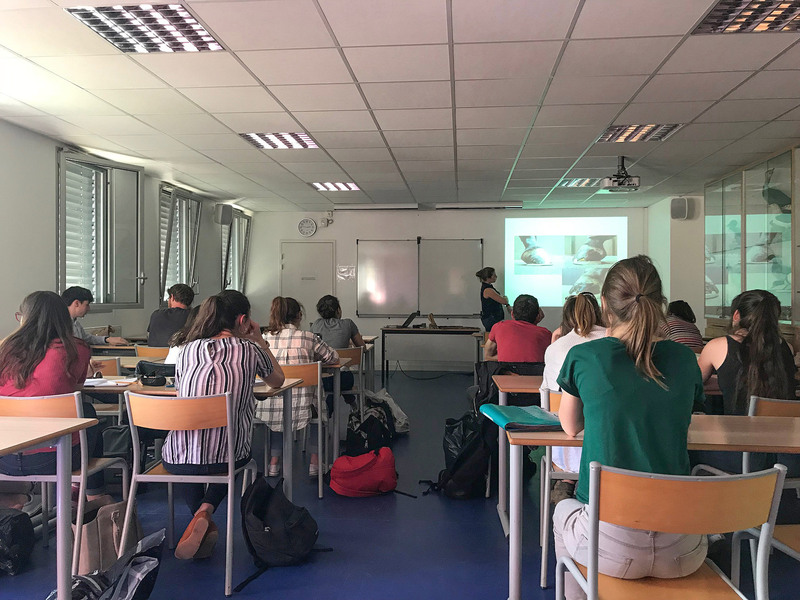 At first, Fabrice Cavé repeated the hoof anatomy, as well as the vocabulary related to shoeing and farriery with the students. After that, Néus Palau-Barreda presented the different foot conditions encountered in practice and their management. The students were able to practice on mares of the university’s herd, to judge the front and hind movements in the manner of a farrier, to make a bandage on a foot abscess and to pull off shoes. Finally, they were able to familiarize themselves with the farrier tools before practicing to pull of the shoes. They also trimmed a prepared hoof in the autopsy building of the school. After this interesting and well spend afternoon, the students were able to enjoy a snack offered by Mustad, an international company specializing in the manufacture and sales of farriery items. We warmly thank our two speakers for this clinic, which was very informative!